The rocket is made from an empty water bottle that has a hole cut out of it’s bottom. I used a knife to cut a hole, but scissors work just as well. A sock is fixed over the cut out hole with a rubber band. I pulled the sock all the way onto the bottle so that the hole had a flat surface over it. I put the elastic band on at the bottom and then rolled the rest of the sock over the elastic band. We dipped the sock portion of the rocket into bubble solution and R blew rocket bubbles!! a. Allow the child to decorate the rocket by providing him/her with a variety of craft materials. 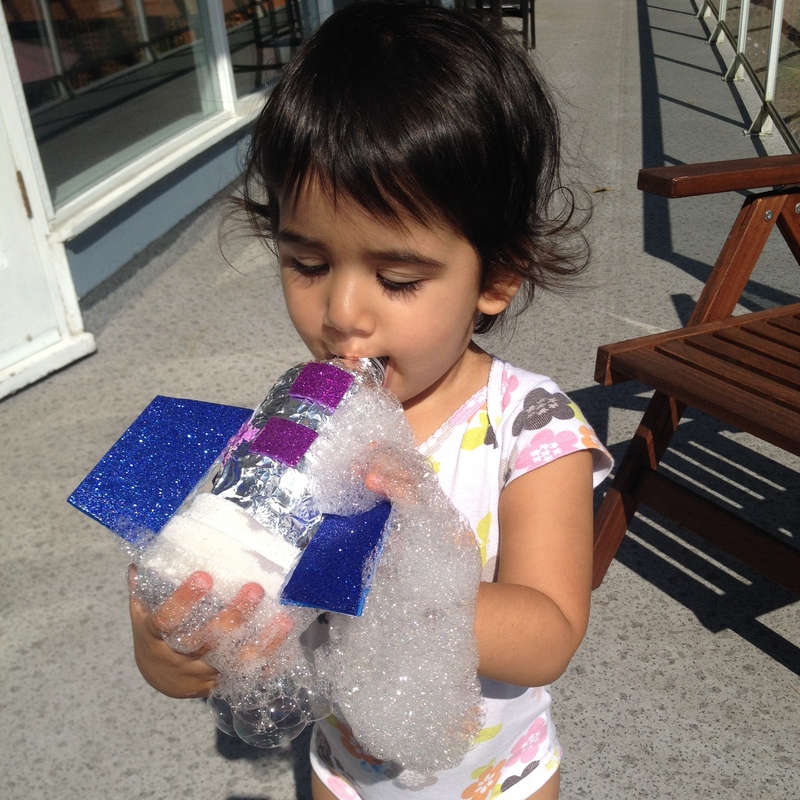 We used sticky-backed, glittery foam pieces to decorate our rocket. b. Do some experimenting. Using the bubble solution recipe found here, test different variations of this recipe to observe how to make the longest bubble snake. Have the child record the recipe and the observations into a science notebook. You can call this activity a Pinterest Fail! I had seen this amazing galaxy slime posted by twodaloo2 and thought I’d try to make some. I couldn’t find any Sta-flo or borax here in Canada and so I thought I’d be a genius and make my own liquid starch by mixing corn starch and water. Let me tell you, it doesn’t work! Despite adding heaping table spoon after heaping table spoon of cornstarch into the glue and attempting to harden it in the fridge, it just wouldn’t turn into the right consistency. I turned the gooey mixture into a paper mâché activity instead and R helped me glue pieces of scrap paper to a balloon. Now, she has an awesome bouncing planet, instead of galaxy slime! a. 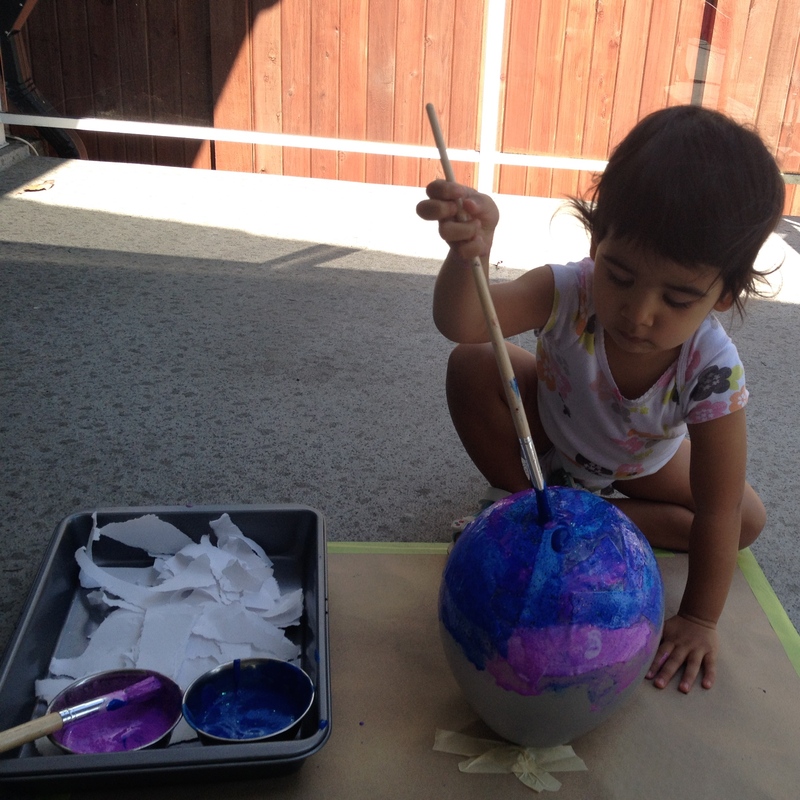 Make galaxy slime using this recipe with ingredients found in Canada (and the UK!). 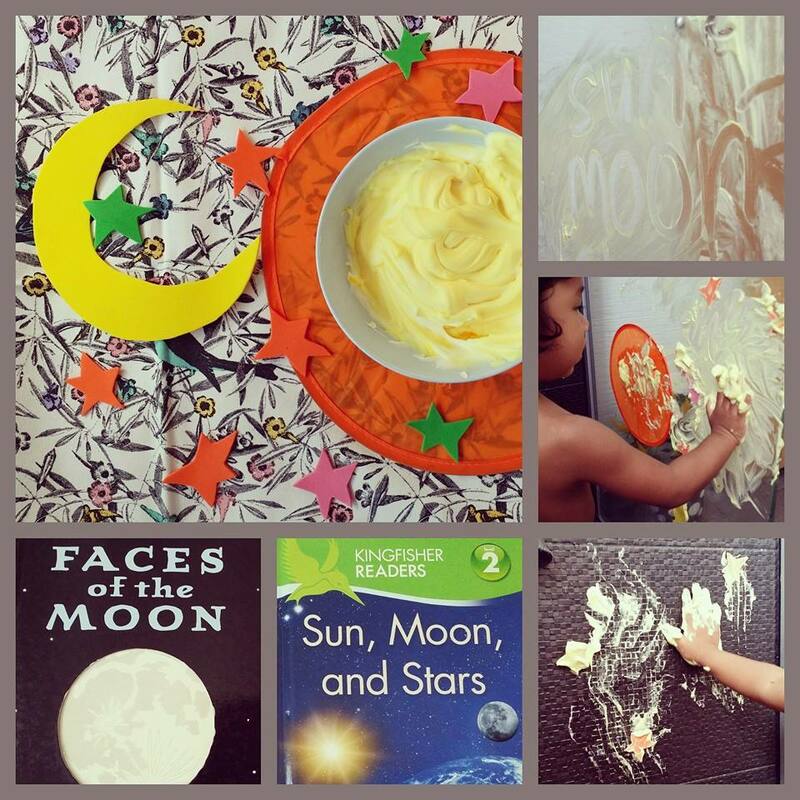 After reading some books about the moon with baby Aisy, who was 27 months at the time of this activity, Arshad created an invitation to play for Aisy using a great foamy paint recipe. Arshad writes, “Since it was hot and sunny outside, we decided to have our activity in the bathroom, making bath time so much fun and our activity cool at the same time.” You can see Arshad’s original post here. That’s all you need to do some foam painting! a. 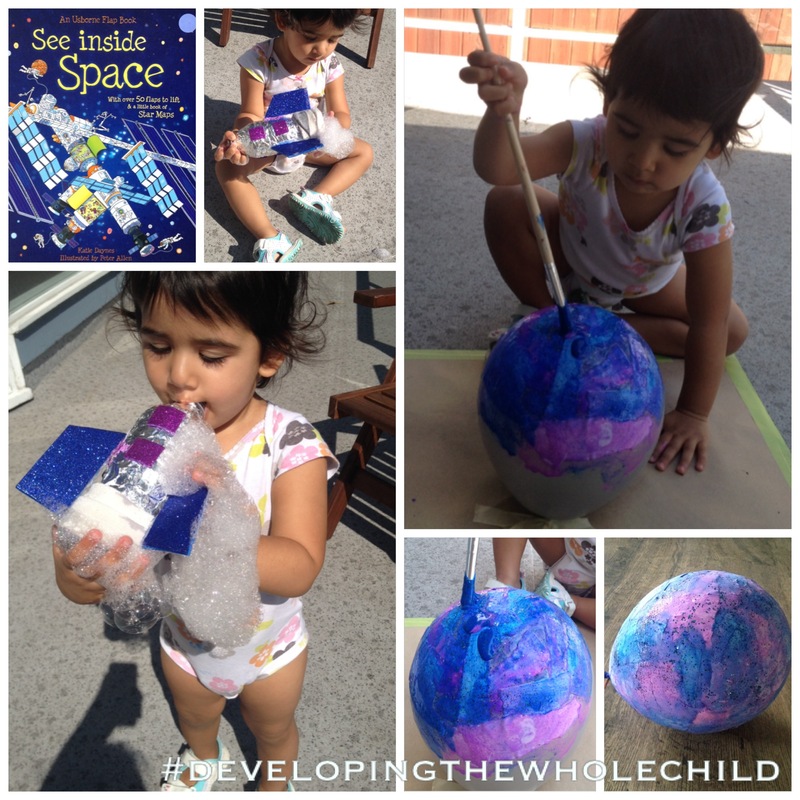 Create the foam paint in a variety of colours and use it to paint a whole space scene as Aisy did with her mom! Remember to click the banner below to vote at Top Mommy Blogs for my blog today! All it takes is a click 😀 I would appreciate it so very much!